I love everything about the Southwest...the architecture, people, weather, art...but most especially the food. I am always inspired by the use of corn, beans, squash and chile in their cooking. I decided the combination would work really well on a pizza. And, since it is pumpkin week at Food Network's Fall Fest, pumpkin is the squash of choice. This red chile pumpkin sauce contains fresh pumpkin puree (although you can use canned in a pinch), onions, green pepper, garlic, New Mexican red chile powder, cilantro and a bit of milk to smooth everything out. It is cooked down, mixed in a food processor and then spread on top of my favorite homemade extra virgin olive oil pizza dough. The sauce is also really good thinned down with additional milk and tossed with hot pasta and topped with cheese and pepitas. Speaking of pepitas (pumpkin seeds), you can buy them, but it is very easy to make yourself. Use the seeds from your sugar pumpkins or from that Halloween jack-o lantern. Try this recipe from Martha Stewart Living. You can use these spicy pepitas or just plain roasted and salted ones on your pasta or pizza. The pizza crust is easy, fast and bakes up light and crunchy. It contains extra virgin olive oil and a touch of honey. I make this recipe all the time. It can be topped with whatever you like...but today, I encourage you to try the pumpkin recipe. Adjust the topping ingredient quantities to suit your taste and, please, let me know what you think. Preheat oven to 500 degrees. 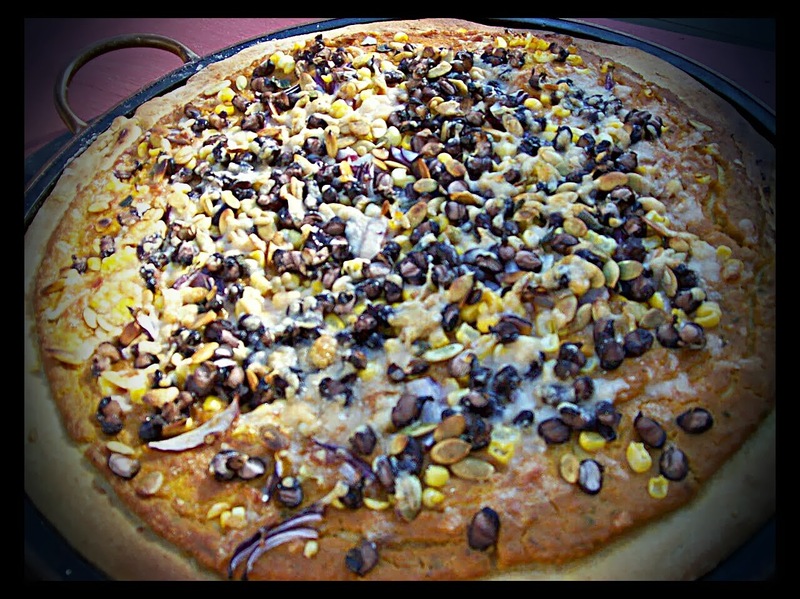 Ladle 1 cup of red chile pumpkin sauce over top of prepared pizza dough. Spread over pizza leaving 1 inch of space around edge of dough. Add additional sauce if you like it a bit more "saucy". I use almost 2 cups on my pizza. Sprinkle corn, black beans, the sliced red onions and cheese over sauce. Top with cilantro and pepitas. Drizzle chili infused oil over pizza, including the "naked" crust edges. Use a pastry brush to cover the naked crust with oil. Sprinkle a pinch or two of coarse grey salt over pizza and place in preheated oven. Bake for 10-12 minutes or until crust is golden brown and cheese is bubbling. Slice and serve immediately. It is "pumpkin" week at Food Network's Fall Fest roundup. Check out the other delicious sounding recipes from my blogger friends. Do you have a favorite pumpkin recipe? Share in the comments section and/or link to your blog if you have one.